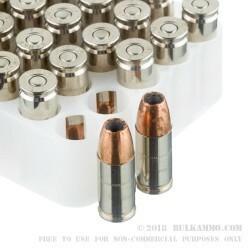 Designed to be incredibly reliable when your depends on it, Federal Premium’s Law Enforcement Tactical 9mm rounds feature a 135-grain tactical hollow point projectile, loaded into noncorrosive, boxer-primed nickel plated reloadable brass cases.. 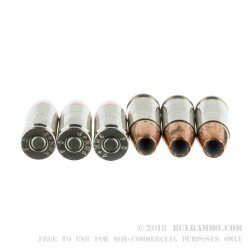 Capable of a muzzle velocity of 1060 FPS, these rounds provide accuracy and consistent feeding while maintaining maximal weight retention with the use of their bonded projectiles. These rounds are designed for higher pressures and are +P, meaning they should only be fired in weapons rated for +P. 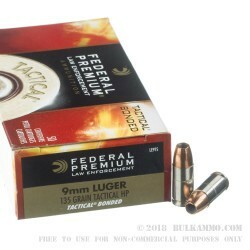 Each box of Federal LE Tactical comes with 50 rounds of 9mm ammunition. Famous for their Premium brand of ammunition, Federal continues to be on the cutting edge of ammunition technology and produces some of the most dependable ammunition available today out of their Anoka, Minnesota manufacturing facility.